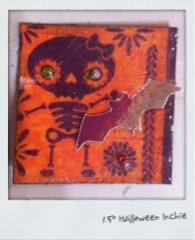 This month at the Lefty Production Swap FB page we are exchanging Halloween Inchies in 1", 1.5" and 2". 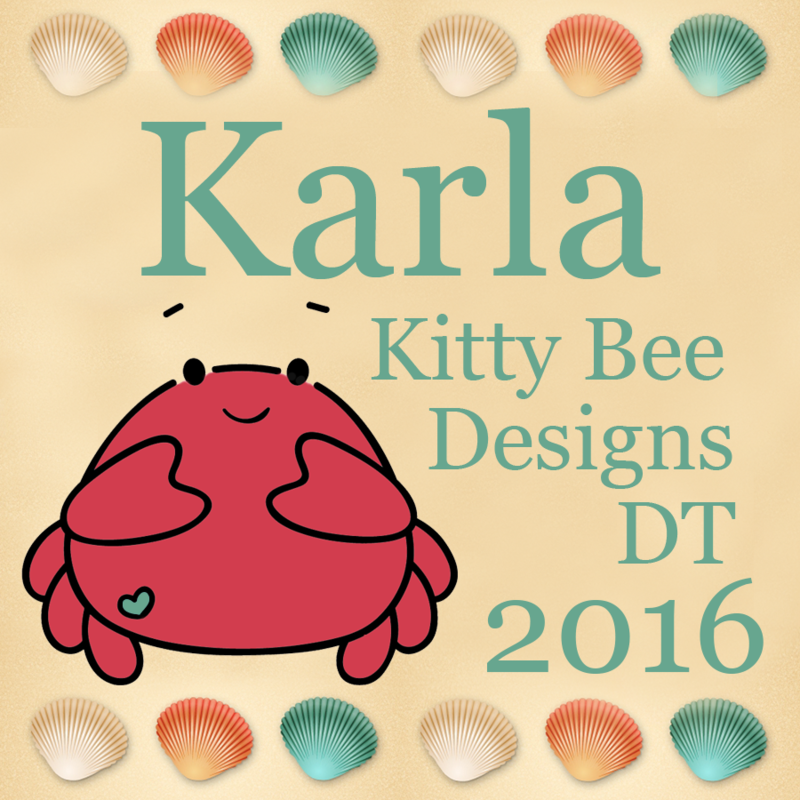 I've never made them before, but I definitely had fun making these! The only problem is wanting to add more and they are sooo teeny :). Simon Says Wednesday Challenge this week is to use embossing on your project and that's what I did! 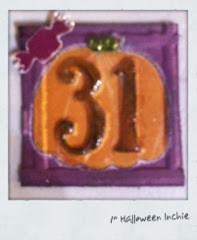 For the 1st 1" inchie I glued a punched orange inked pumpkin onto a piece of purple cardstock, which I then placed into a Bingo embossing folder, under the number 31, and dry embossed. I coated the raised numbers with Glossy Accents and added a punched candy wrapper. 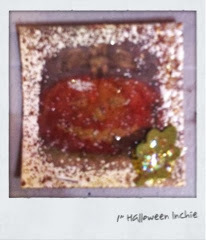 For the 2nd 1" inchie I cut out a pumpkin from the Tim Holtz Seasonal paper line and coated the edges with Versamark and then dipped them in embossing powder (Shabby white- which is a mixture of white and gold glitter) and then added some Glossy Accents to the pumpkin and a punched leaf with a bit of Stickles. For this 1.5" inchie I layered 3 coats of UTEE and on the last coat pressed in the punched bat and the green beads for the eyes and the red bead for the flower center. I put a bit of washi tape on this 1.5" inchie and embossed my words on top of it. I cut the skull out of a piece of patterned Halloween paper and put Crackle Accents on the teeth, Stickles on the leaves and glued beads to the eye sockets - spooky! 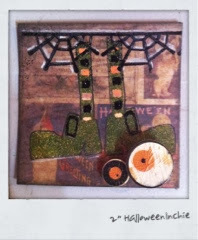 I used Tim Holtz Peeled Paint Distress embossing powder for the witches shoes and stocking on this 2" inchie, onto a background of the TH Seasonal paper. 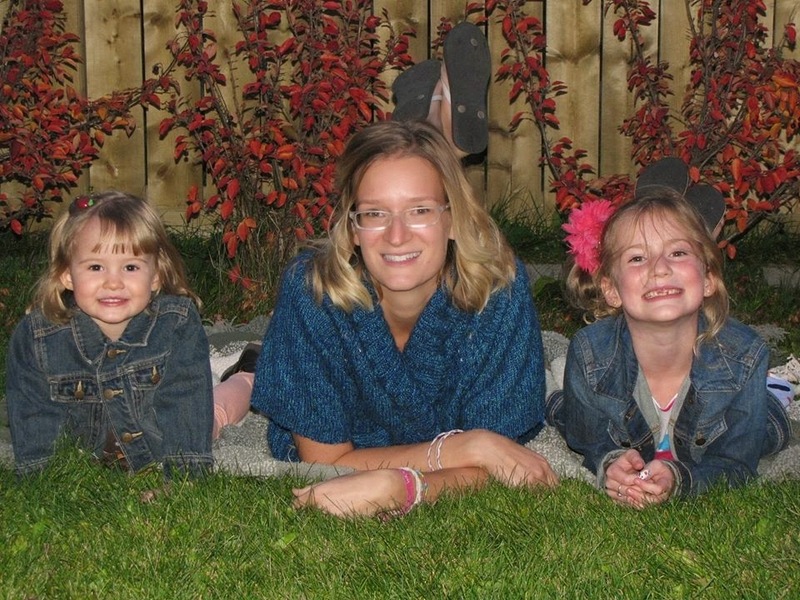 I coloured them in with Souffle gel pens and then stamped and heat embossed the black spider web. I used a little chalk pencil for outlining. The eyeballs are stickers that I put Crackle Accents on and popped up with foam dots. 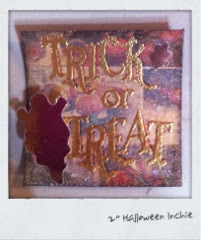 For the last 2" inchie I heat embossed Trick or Treat in gold embossing powder on Tim Holtz Seasonal paper and placed a punched silver ghost on top using foam tape. 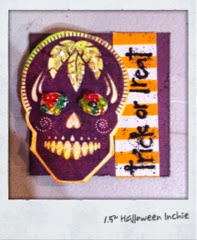 This was a fun way to use up some Halloween stuff in my stash and was a nice quick project!